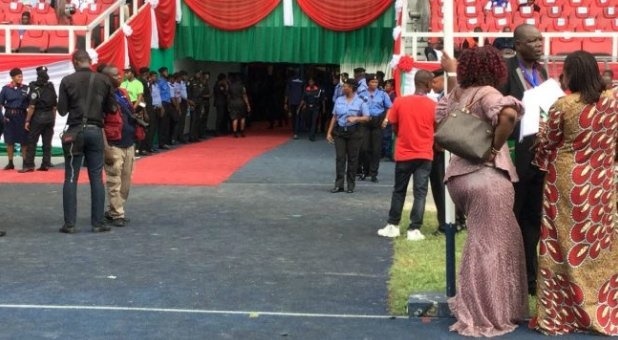 Accreditation of delegates for the 2018 special national convention of the Peoples Democratic Party (PDP) is currently going on outside the main stadium of the Adokiye Amesiemeka Sports Complex, Igwurita-Ali, Rivers State, venue of the convention. Already seated at the stadium are the Deputy Senate President, Senator Ike Ekweremadu; Abia State Governor, Dr. Okezie Ikpeazu and several other leaders of the PDP. No fewer than 12 presidential aspirants, including Senate President, Senator Bukola Saraki; former Vice President, Atiku Abubakar; Sokoto State Governor, Alhaji Aminu Waziri Tambuwal and former Senate President, Senator David Mark. Others are former Kano State Governor, Senator Rabiu Musa Kwankwaso; former Jigawa State Governor, Alhaji Sule Lamido; Gombe State Governor, Alhaji Ibrahim Dankwambo and former Minister of Special Duties, Kabiru Turaki. Also Read: 2019: Which Of These 12 PDP Aspirants Will Face Buhari? Also in the race for the PDP presidential ticket are former Sokoto State Governor, Alhaji Attahiru Bafarawa; founder of Baze University, Abuja, Datti Baba-Ahmed; former Kaduna State Governor, Senator Ahmed Makarfi and former Plateau State Governor, Senator Jonah Jang.